Fibrous, fibrohistiocytic, and myofibroblastic tumors of intermediate malignancy comprise a group of lesions that has a relatively high risk of local recurrence, but a limited risk of metastasis. Most of these tumors present in young adults as superficial masses. 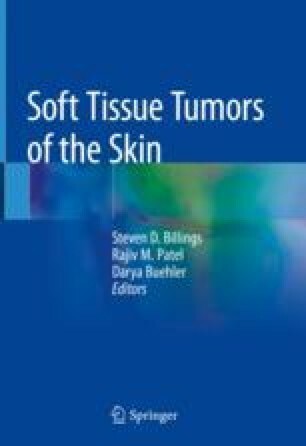 Members of this group include dermatofibrosarcoma protuberans and its numerous variants, plexiform fibrohistiocytic tumor, angiomatoid fibrous histiocytoma, giant cell tumor of soft tissue, and inflammatory myofibroblastic tumor.